Many studies have revealed that college students today arrive on their campuses with high literacy in the latest technology and mobile devices. It is not uncommon to see students walking around with their beat earphones, texting while waiting in the hallway, and snapchatting with their friends in the dining hall. Yet, in the sea of options, what educational technologies are students using to help them with their studies? In the video above, I interviewed a trio of undergraduate students at St. Cloud State University (SCSU) to quiz them on their favorite tech tools and innovations they hope to see in the future. All that tech has caused something of a dependency, too. The following infographic reviews responses from SCSU students about their technology-using habits — ultimately showing a trend that leads to a techno-reliant generation. Ideas/comments? Add your two cents to the comment section below! So, this semester, I challenged myself by changing my approach to creating the syllabus for my freshman-writing class. By referring my students to all detailed information put on the course website, I reduced the dreary document into a 2-page course overview and added some colors to the layout. I have come to realized that a course syllabus should articulate only the gist of the course, which attracts students to find out more by redirecting them to other more-suitable avenues that contain detailed information about the course. See the PDF of my syllabus here. Do you have a creative syllabus? Link it in the comments! Updated: Came across this humorous post by College Humor today and so I decided to add it to this entry. Earning a higher educational degree is a notable pursuit. This pursuit usually starts when one has developed an interest around a certain area of study and began looking for universities and programs that meet his/her academic needs. Yet, as a graduating master’s student and Ph.D. applicant, I cannot rant enough how frustrating the process of school-finding can be. My first instinct was to speak with my advisors about possible programs to look into, and then go on Google to find out more about these schools – about their department culture, Ph.D. dissertations written by students, faculty members’ research areas, criteria for admittance, etc. Miserably, I felt luck was a huge, integral part of the search process. To help Ph.D. applicants narrow their searches, Rhetoric Review conducted its fourth Survey of Doctoral Programs in Rhetoric and Composition in 2007 and published a print article in RR 27.4 (2008). Later, a Wikia site was set up to allow program directors update their department or program information. However, if you take a look at both the original site and wikia, you may find it challenging to navigate through the sites for a comprehensive outlook across the programs reviewed. This is why we designed and launched Ph.D. 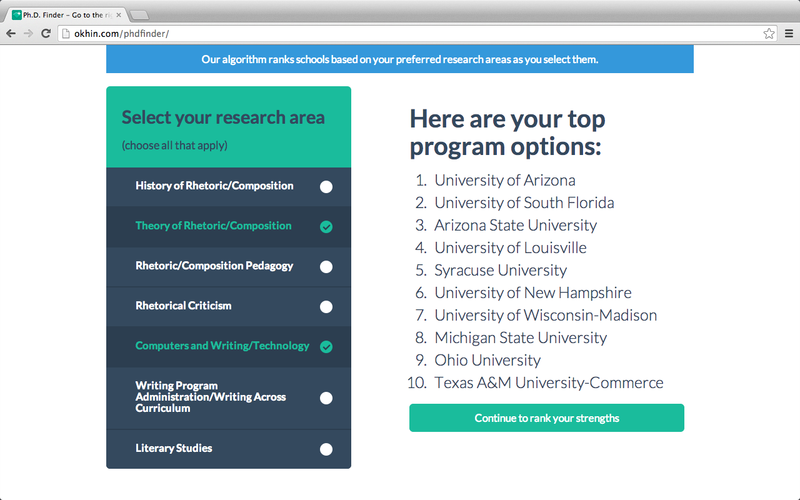 Finder – an interactive app that allows users to find Ph.D. programs in Rhetoric & Composition that most closely match their admittance aptitude and research interests. 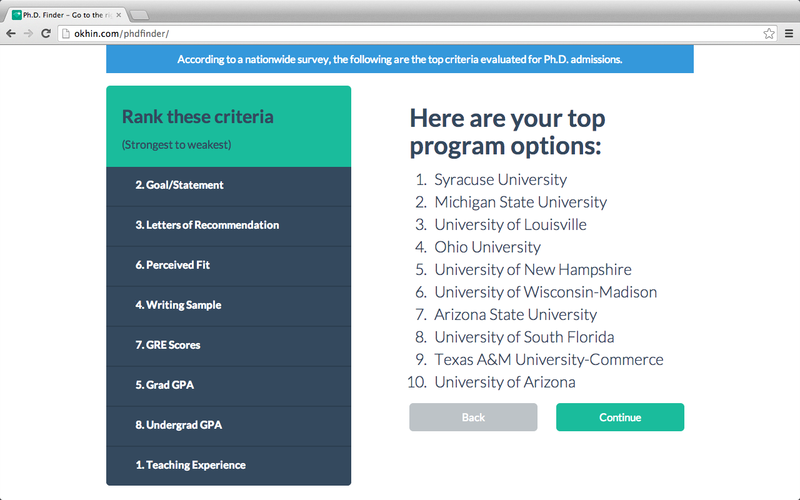 Our algorithms are designed to rank programs based on the user’s selection of research interests and self-ordered strength in the criteria commonly used by Ph.D. admission committees for candidate evaluation. 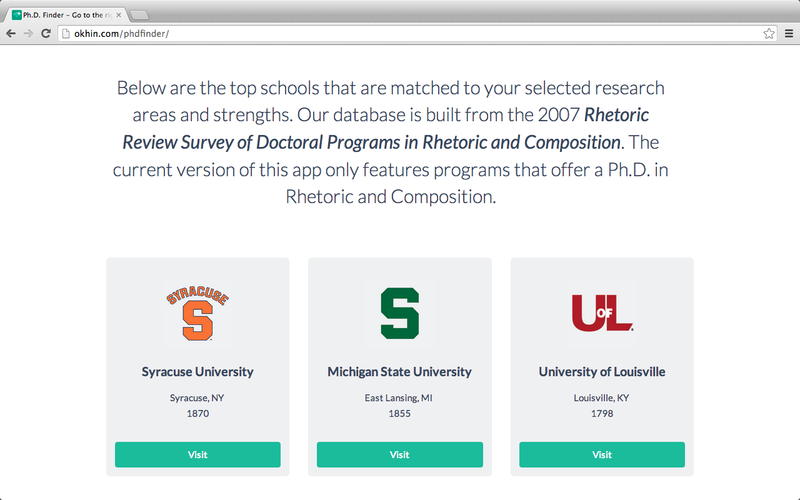 We aggregated data from the Rhetoric Review Survey and picked out programs that currently offer a Ph.D. degree in Rhetoric and Composition. Users will be able to see real-time adjustment on the program ranking as they select their area(s) of research and order their admittance aptitude. As this app is still in its infancy stage, we realize there are rooms for improvement and look forward to add more programs to our existing database. Since this app is a startup-like project created by two college students, we are, nonetheless, looking for fundings to help us expand this endeavor. Please contact us if you are interested in a partnership or backing us up. At the meantime, check out the app and let us know what you think! Ph.D. Finder is created by Ivan Okhin and Jason Tham, both social entrepreneurs (wannabe) and technology enthusiasts based in St. Cloud, Minnesota.